Key share indices ended higher Monday on firms gains in Asia and Europe led by Reliance Industries and financial shares. 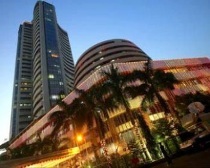 The Sensex, after a firm opening, rose to a high of 16,187. The index finally ended with a gain of 472 points, or 3%, at 16,167. Nifty ended up 141 points at 4,851. Asian markets rose on hopes Europe will come closer to a euro zone bail-out fund. The Euro rose on a report that the International Monetary Fund was preparing an aid package for Italy, but later pared gains after doubts were cast on the report. In Asia, Nikkei surged 1.6% to 8,287. Hang Seng was up 2% at 18,037. European markets also opened on a firm note. CAC and DAX advanced around 3-4% each. Market heavyweight, Reliance, was the top contributor to Sensex's pmove and jumped 3.7% at Rs 782. The Reliance group and Bharti have terminated talks on the proposed acquisition of Bharti's 74 per cent shareholding in two insurance companies -- Bharti AXA Life Insurance Co and Bharti AXA General Insurance Co -- by Reliance. The Mukesh Ambani led company has sent an arbitration notice to the Oil Ministry over the move to disallow some of the expenditure the Mukesh Ambani-led firm has made in the KG-D6 gas fields as punishment for falling output. Among the financial shares, HDFC ended up 5% at Rs 645, ICICI Bank rose 4% at Rs 751 and State Bank of India gained 5% to close at Rs 1,776. BSE metal index shone in trades and went up 5% to 10,373 as prices rose in the London Metal Exchange. BSE bankex, PSU and oil & gas indices were up over 3% each. Metal shares led gainsbacked by a softer dollar and hopes Italy may secure financial aid as Europe takes steps this week to ease funding strains on the euro zone's troubled economies. each. Tata Steel was up 3.5% at Rs 387. However, data showed that India's imports of finished steel dipped by over 35% to 2.88 million tonne in the April- September period of the current fiscal. "It is possible that the short term uptrend has some way still to go on the upside, so one should remain invested for now. "However traders should look to sell at slightly higher levels when this short term uptrend shows signs of peaking. "It is difficult to set any targets for this short term uptrend -- it can turn downwards any time, or it may extend up to around 5200 at best," said Hormuz Maloo, Technical Analyst, Geojit BNP Paribas Securities. Auto shares gained on hopes of petrol prices falling once again this week, in line with international prices. Tata Motors rose 5.7% at Rs 182. Maruti Suzuki gained 2% at Rs 968. Meanwhile, Bajaj Auto slipped 1.7% at Rs 1,614 while Hero MotoCorp dropped 0.6% in trades. Meanwhile, retail stocks were under pressure on the bourses due to strong protest from the opposition parties on foreign direct investment in the sector. While Ficci extended an all-out support to the government, CII recommended "a calibrated approach for introducing FDI in the retail sector in terms of the percentage and minimum capitalisation requirements". V2 Retail, Shoppers Stop, Store One Retail and Pantaloons Retail were down 4-10% each. Other notable gainers include, Financial Technologies surged 13% to end at Rs 653 after it received approval from the finance ministry for the initial public offering of Multi-Commodity Exchange Ltd, in which it has 31% stake. Educomp Solutions ended up 16% to close at Rs 217 after the company said a leading public sector bank has sanctioned Rs 410 crore to buy out its receivables. BSE market breadth was fairly positive. Out of 2,866 shares traded, 1,915. shares advanced while 874 shares declined in trades. How secure are we, three years after 26/11?